This summer's Ashes series could be decided by the performance of Australia's batting line-up, says former England spinner Graeme Swann. Australia were beaten 3-0 the last time they toured England, but were 5-0 victors at home in the 2013-14 series. Swann, part of BBC Test Match Special's ball-by-ball commentary team, said: "I don't think the Australian batting line-up in England is as strong. "Nearly all of their batsmen struggled when we beat them here in 2013." Swann, who took 255 wickets in 60 Tests, also believes the teams' fast bowlers will have important roles to play. The 36-year-old said: "England have James Anderson and Stuart Broad, Australia have Mitchell Johnson and Ryan Harris. "Whichever pair is more prolific will give their team a very good chance." 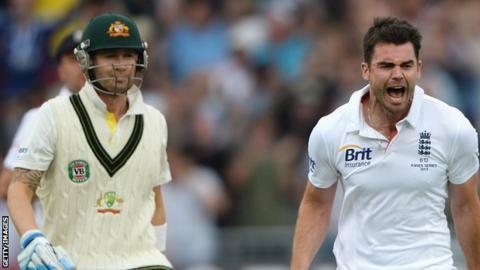 Johnson and Harris have taken a combined 404 wickets in 93 Tests, while Anderson and Broad have taken 690 in 183. Don't miss a ball on BBC 5 live sports extra and the BBC Sport website. Swann believes England captain Alastair Cook will look to add elements of the one-day team's dynamic approach to the Test side. Cook was not involved as England beat New Zealand 3-2 in a limited-overs series characterised by a new-found adventure from the hosts. "I don't know how much of the aggressive style of the one-day team will eke into the Test set-up," said Swann, a three-time Ashes winner. "But Cook will need to glean whatever he can from that one-day squad and try to get those good points into the Test team. "That's not teeing off from ball one, but taking on the opposition head-on." Test Match Special will have live coverage of every ball of the series on BBC Radio 5 live sports extra and at bbc.co.uk/cricket. You can follow it wherever you are, with commentary on your mobile or tablet via the BBC Sport App. NB: Other programmes will be announced when details are confirmed. Programmes and start times are subject to change.